The supplier of handcrafted copper baths and basins. 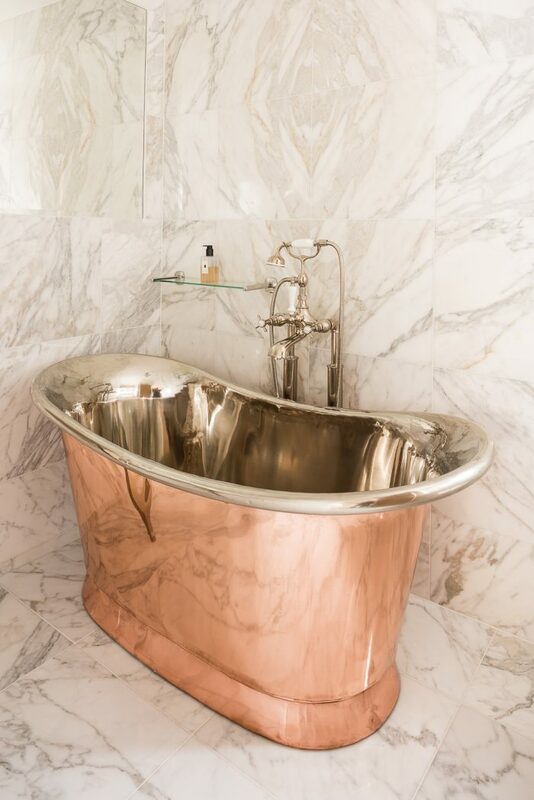 Since it’s establishment in 2002, William Holland have forged an unrivalled international reputation as the world’s leading manufacturer and supplier of copper baths and basins. We invited the bathroom experts to join us in conversation about bathroom design. Talking tiles, colours schemes and of course handcrafted baths! What is it about a William Holland designed bath that makes it so unique? 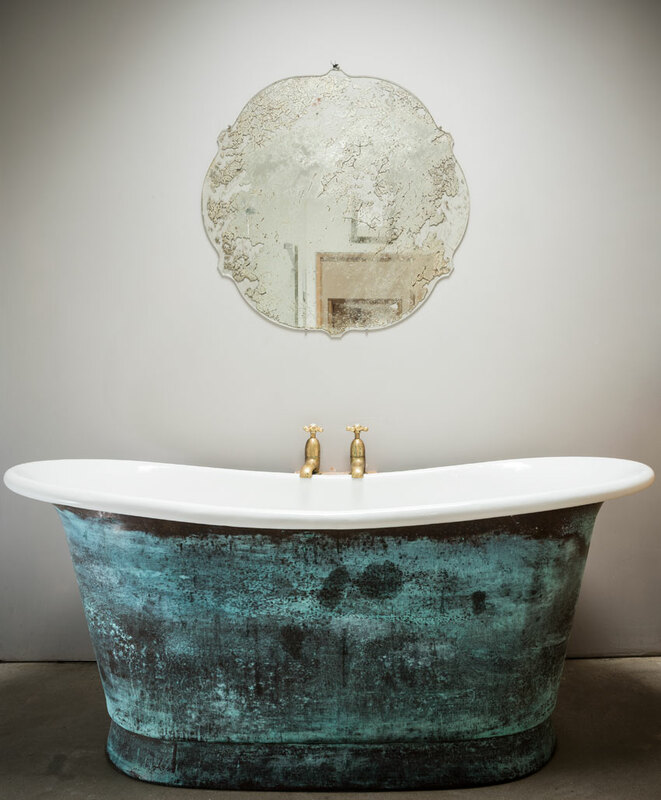 William Holland are the original contemporary copper bath manufacturer and the world’s leading experts in the field. Each bath is meticulously designed for maximum comfort. Not only are our products luxurious to bathe in, they are stylistically beautiful, making them a work of art. Can you identify it from others? The distinctive lines and balanced design of our handcrafted baths are instantly identifiable when compared to their mass produced counterparts. Extensive work goes in to creating a William Holland bath. The precise angles, gently sloping sides and curved flair create a deep bath, which supports the back and recline of the neck. These tiny details may not be obvious from the aesthetic, but make a huge difference when reclining in a hot bath ready to while away an hour with a glass of wine and a good book. Comfort is everything. All our baths are lovingly hand finished to order by our team of master craftsmen in Dorset. We offer an unrivalled range of finish combinations and bespoke designs that other companies simply cannot provide. This expertise allows us to offer bespoke and creative designs as well as exceptional after care and advice. Bathing is a ritual that is associated with relaxation. 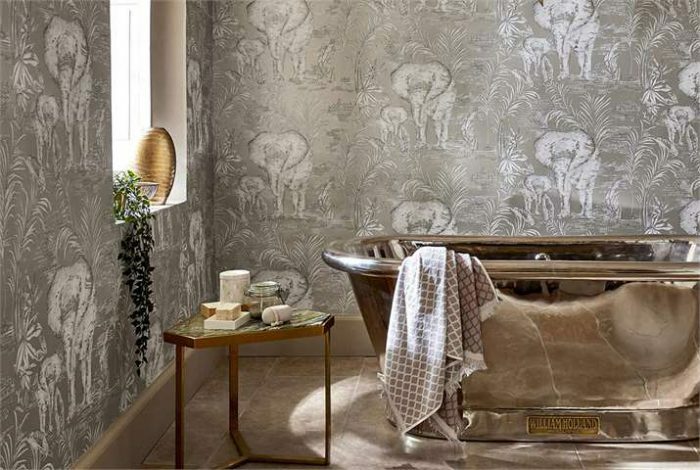 What is it about your baths that allow them to be on trend and comfortable in equal measure? The heat retaining qualities and ergonomic designs of our baths create the perfect environment for a long luxurious soak. Add to this the extreme versatility of the designs and finishes available and there is a William Holland bath to suit nearly any interior design. From Traditional to Contemporary, Rustic-Luxe to Industrial, our craftsmen can create the perfect look for any chosen style. And, the natural beauty of copper and brass is undeniable. As the light reflecting properties of the metallic finish refracts the light in waves of dancing ripples around the room they create an oasis of soothing calm. When helping a client design their bathroom, what are the most important aspects to consider before deciding on the finer details? Function is key. Bathrooms are after all an essential area of any home and need to suit the needs of the client. Whether it is a family bathroom, a private sanctuary or a petite space in need of a little luxury the first step is to decide on the key feature and go from there. Most of our clients decide on their dream bath, before choosing complimenting tiles, paint and accessories. Has there been a particularly exciting or challenging project you have worked on recently? We have been thrilled to work on some amazing projects, many of which have featured in Grand Designs due to their creative and exceptional nature. One of our favourites of late has been the Woodsmans Treehouse by Guy Mallinson. 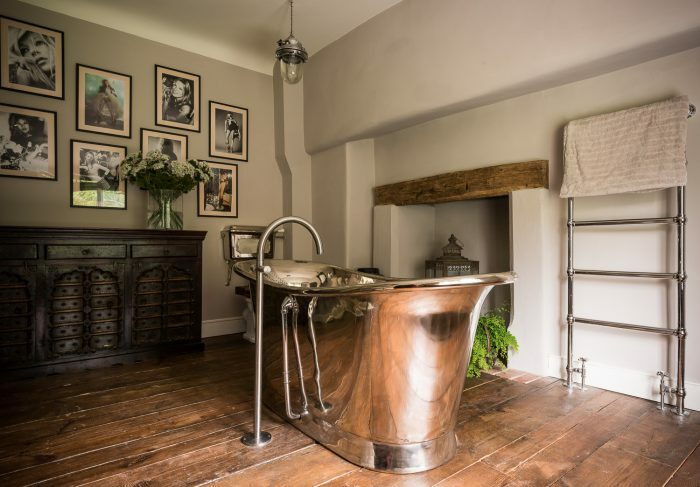 A Grand Designs Favourite, and shortlist for Property of The Year, this project featured our Rotundus Spa Bath 30 feet up an ancient oak tree. The thought behind this bathroom design was so clients could bathe amongst a canopy of leaves and stars. The properties of the bath including its lightness in weight and hard-wearing nature, made it the perfect product for this adventurous project. The results were outstanding. As the product is so versatile we are able to work on many exciting and creative projects. From Art Deco Hotels, to treehouses, luxury yachts, castles… the opportunities are endlessly intriguing. 2018 has seen an increase in popularity for colour. Has the bathroom been an area that has followed in this call for brighter living spaces? Given it has always been an area notorious for neutral shades. Absolutely! The rise of metallic interiors, we believe, has strongly influenced the rise of colour within bathrooms. 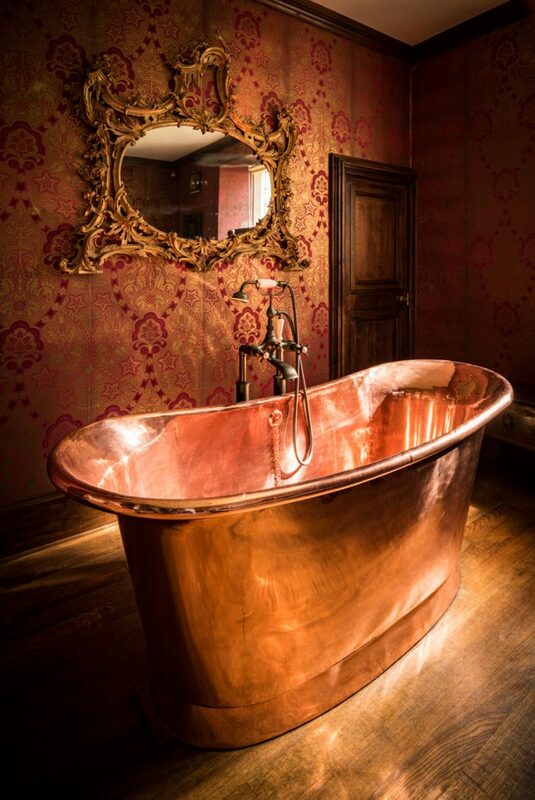 Glimmering copper baths are a world away from the functional white bathroom suites of yesteryear. They have opened the doors for bathrooms to become expressive and emotive rooms full of glamour and creativity. Bathrooms are no longer purely utilitarian spaces. You are able to combine functionality with creativity to create glorious inspiring interior spaces.